JULY 8, 2016: Despite wide bipartisan legislative support, Governor Charlie Baker vetoed the two-year extension of the Municipal Retiree Health Insurance Premium Moratorium. Association officials are now seeking a House and Senate override of the veto, which must take place no later than July 30th. JUNE 30, 2016: On the final day of Fiscal Year 2016, the State Legislature passed a new state budget for the coming fiscal year. Contained within the budget, as Section 45, is a two-year extension of the Municipal Retiree Insurance Premium Moratorium. JUNE 21, 2016: Members are asked to contact their Massachusetts State Senator and Representative and ask that they support Section 46 of the Senate Budget – which protects municipal retirees and retired teachers from unfair increases in local health insurance premiums. 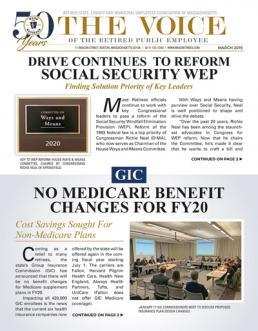 JANUARY 2016 VOICE: A major budget deal between the White House and Congress has come to the aid of public retirees, who had been bracing for a major increase in Medicare Part B premiums for 2016.